The article touches upon the issue of Conservation status of the Cherry Barb (Puntius titteya). The Cherry Barb originally comes from Sri Lanka. 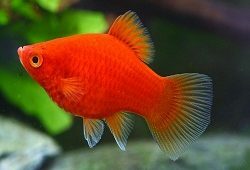 It is very common in the aquarium trade, as it is hardy, easy to breed, peaceful, small and quite pretty. The vast majority of individuals seen in pet stores are captive bred. In the wild it is threatened by habitat destruction (Ekaratne, 2000). The cherry barb lives in forest streams in Sri Lanka and much of Sri Lanka has been deforested. There are also problems with introduced fish species in Sri Lankan freshwater habitats (Ekaratne, 2000), although I am not sure if the cherry barb is affected by this directly. The IUCN lists the Cherry Barb as being lower risk but conservation dependent. This means that it would be listed as vulnerable except that there are programs in place to protect it (Pethiyagoda, 1996). It was listed as vulnerable prior to the conservation initiatives being implemented. 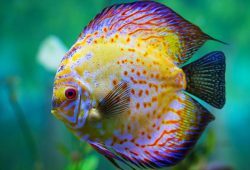 However, its status has not been updated since 1996, which makes it difficult to determine how well the fish is doing now. 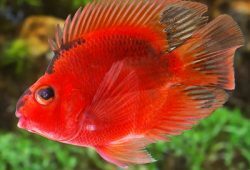 Some especially colorful varieties may be being overfished for the aquarium trade, although some of the cherry barbs exported from Sri Lanka are hatchery bred (Ekaratne, 2000). The Cherry barb is present in the Sinharaja forest reserve, which is the last large area of primary tropical rainforest on the island. The status of this reserve as the largest on the island is rather startling to me, as it is only 21x4km in extent (Sinharaja forest reserve). 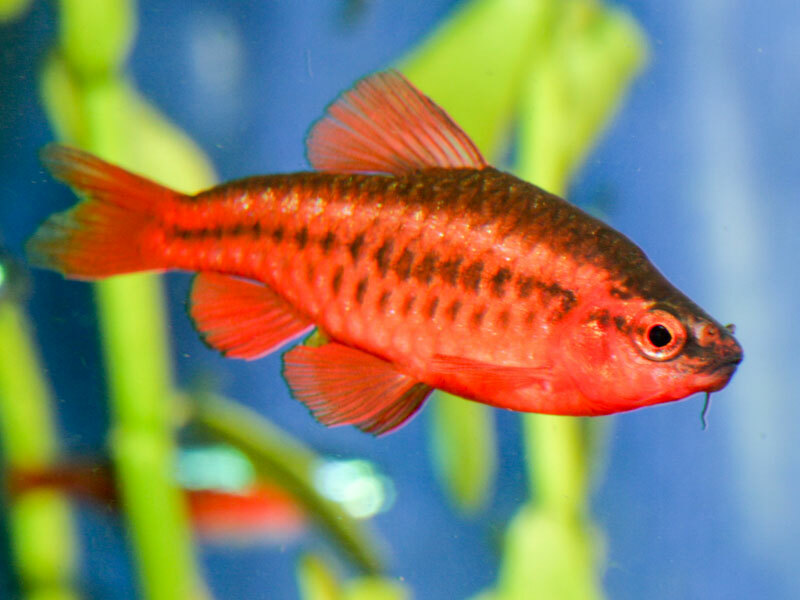 Still, the cherry barb is a very small schooling fish so it may be big enough to preserve the species provided that the fish are efficiently protected within the park. The protection of the specific especially colorful varieties is another question. Overall, I would probably avoid buying wild caught cherry barbs but there’s certainly no problem with buying the captive bred ones. Of course, telling the origin of the fish is difficult when most pet shop workers do not necessarily know where the fish come from. This is a standard problem with the aquarium hobby for far too many species.